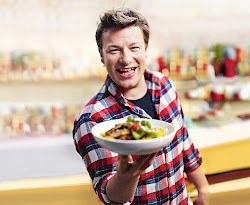 The amazing thing with this cooking adventure of trying out 100 of Jamie Oliver’s recipe is that I am beginning to learn and recognize the different herbs and short cuts to prepare certain ingredients. With this attempt, I learnt that to help you peel that skin off that tomatoes, you can simply boil them first for a quick 30-60 seconds. And “wala”, the skins can be pinched off easily. This dish…just so pretty. And healthy, healthy, healthy! 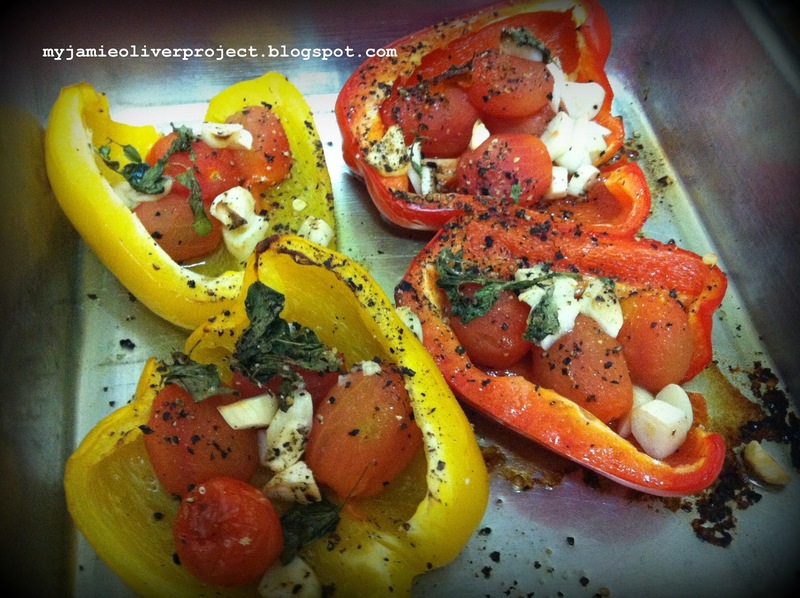 If you love bell peppers (or also known as capsicums) and tomatoes, you will love this one. Preheat the oven to 400F. Cut the peppers in half and remove the seeds. Place in an oiled baking dish and lightly season with salt and pepper. Price the cherry tomatoes with a knife and place in bloing water for around 30-60 seconds until the skins can be easily and quickly pinched off. Feel free to run cold water over them before peeling. Once peeled, place the tomatoes in the peppers. Stuff your herbs and sliced garlic and season. You could drape over some anchovies insteadof using seasonging at this point. Drizzle with oilive oil. Cook in preheated oven for 15 minutes lightly covered with aluminium foil, then around 30 minutes without. The smallest little splash of herb veniger on each pepper can be a real joy. Bell peppers, also known as sweet peppers or capsicum, come is variety of colors. They are the member of the nightshade family- the same plant family of potatoes, tomatoes and eggplant. Bell peppers are very nutritious and excellent food for health. Bell peppers are very rich in antioxidants and also excellent source of Vitamin A and Vitamin C. They are high in fibre, folate and manganese as well. Overall, bell peppers are extremely healthy and great in taste too. What are the differences between Red, Green and Yellow Bell Peppers? Red, green and yellow- these bright colored bell peppers are extremely nutritious and they contain some of the best nutrients available. Green bell peppers are harvested before they are fully ripe; they are very crispy in taste. Green bell peppers are less expensive than red and yellow bell peppers. Green bell peppers are very good source of fiber, folate, and vitamin K. They also contain significant amount of beta-carotene. Yellow bell peppers are more mature than green bell peppers and have a fruity taste. They contain more amount of beta-carotene than green bell peppers. They also contain more amount of Vitamin C than the green bell peppers. They are harvested before they fully mature and turn red. Red bell peppers are mature than green and yellow bell peppers. They also contain eleven times more beta-carotene than green bell peppers. Not only that they contain more Vitamin C than both green and yellow bell peppers. Red bell peppers are excellent food to prevent prostate and breast cancer. Bell peppers are excellent for health regardless their color. But among them red bell peppers contain more nutrition than the other two.